Pleased to share our new partnership with Form Factory Inc. Foods! Exciting times! Portland, OR – August 6, 2018 – Portland-based cannabis products co-packer Gruner Apfel, now known as “Form Factory Inc.,” and Vertical Companies of Agoura Hills, CA, today announced a joint partnership where Form Factory Inc. is scheduled to build a full production facility at Vertical Companies’ licensed Needles, CA, campus to co-pack an array of new infused products for the California medical and adult recreational cannabis market. The facility is the first California Form Factory Inc. co-packing facility to open under its Form Factory Inc. partnership with MacArthur Capital. Form Factory will manufacture the branded cannabis edibles for the California market. Vertical cultivation and extraction will provide raw cannabis ingredients, and Vertical distribution will bring these products to licensed retailers throughout the state. Led by food and beverage industry veteran Tony Bash, former VP of Sales for innovative food, beverage, and spirits giant LiDestri, Form Factory Inc. Foods is the first food and beverage packing company licensed by the Oregon Liquor Control Commission (OLCC)’s Recreational Cannabis Division. The company is currently packing products for a rapidly expanding list of edibles, beverage, and topical brands. Form Factory Inc. Foods is the first Oregon-based company licensed by the OLCC’s Recreational Marijuana Program to pack and bottle cannabis-based food and beverages. The company covers all aspects of production, from concept to final execution, using modern equipment, professional packaging, and decades of experience in the industry. It is Form Factory Inc. Foods’ mission to package and bottle the healthiest, freshest products for the cannabis food and beverage industry. Vertical is among the first and largest vertically integrated companies in the legal medical cannabis industry. It has operations in AZ, KY, and CA, combined with strategic partnerships in OH and additional markets which position it well to take advantage of the legalization and normalization of cannabis globally. 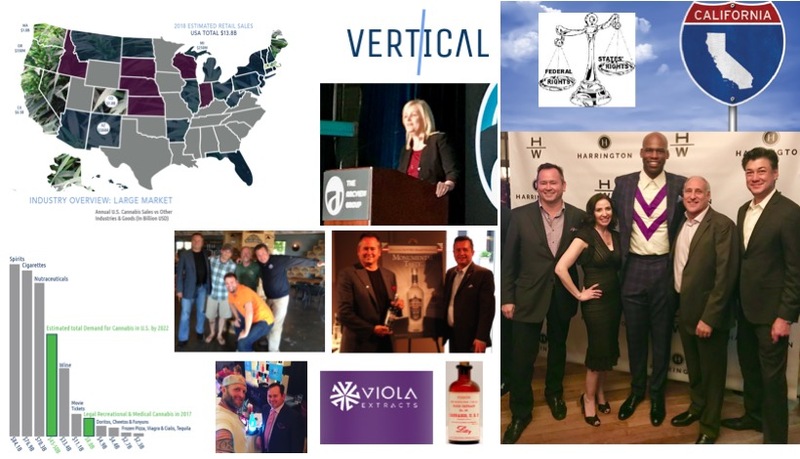 Vertical is led by an executive team of entrepreneurs and business leaders from the alcohol beverage, agriculture, CPG, distribution, entertainment, food, healthcare, and medical industries. When Prohibition was repealed in 1933, small, local brewers and distillers were the first to get back into the alcohol business. Many either grew into national brands or were snapped up by larger companies looking to expand. Today, the same scenario is occurring with beer, wine and spirits infused with hempseed oil, cannabidiol or cannabis terpenes. Colorado-based New Belgium Brewing, for example, recently unveiled a hemp beer, while California-based Lagunitas Brewing last year offered a brew infused with cannabis terpenes. “We’re in a unique moment in time. There are no big hemp or CBD alcohol brands yet, so there’s a window – maybe for the next three to five years – to establish a brand,” said Smoke Wallin, chief marketing officer and president of distribution for Vertical, a company in Agoura Hills, California, that is developing a CBD oil that can be infused into alcohol. Some big companies are wasting no time, especially with Canada poised to legalize recreational marijuana. Last October, New York-based Constellation Brands, which distributes more than 80 wine, beer and spirits brands, paid $190 million (CA$245 million) for a 9.9% stake in Canadian cannabis cultivator Canopy Growth Corp. Wallin and others believe more large beverage companies will follow. That translates into business opportunities for hemp growers, CBD producers and companies that extract oils such as cannabis terpenes. Those products don’t carry the same stigma in the United States as THC-laden marijuana, but it won’t be a slam dunk. The marriage of alcohol and cannabis faces unique regulatory and legal hurdles, making it difficult for hemp, CBD and extraction companies to produce their own booze. The simpler option for those companies is to sell their products to alcoholic beverage manufacturers to get a foothold in what could become a lucrative product niche. That’s what Joe Pimentel did. In 2017, Pimentel, the owner of Luce Farm in Stockbridge, Vermont, decided to start producing CBD-infused honey to set his farm apart from other area hemp growers. He approached Long Trail Brewing in Bridgewater Corners, Vermont, about carrying the honey in the brewery’s restaurant and gift shop. “The CBD hemp market is so immature, so our strategy is to align with a lot of Vermont brands that are better known than ours,” Pimentel said. Long Trail decided not only to sell the honey, but also to make a beer with it. “We liked that the hemp gives us new flavors we can’t get anywhere else,” said Head Brewer Ian Harbage. But the honey played havoc with the beer’s consistency, so the brewers opted for Luce’s CBD extract and hemp terpenes instead. Terpenes are separated out at the beginning of the hemp-extraction process, like an essential oil, and then the CBD extract remains. Pimentel used to do his own extractions, but “nothing we could create in our kitchen had consistent levels of THC,” he said. He started researching the best extraction techniques and decided on a carbon dioxide method offered by the PhytoScience Institute in Waterbury, Vermont. PhytoScience now handles all of Luce Farm’s hemp extractions, and the terpenes are consistently documented at less than 1 part per million THC. CBD has more health properties but not as much flavor and aroma as terpenes. “The main terpenoid in cannabis is the main flavor in hops, which makes terpenes and beer a good partnership,” said Andrew Follett, the owner of Philadelphia-based Keystone Canna Products, which was founded in 2014 to help hemp farmers distribute nationally. 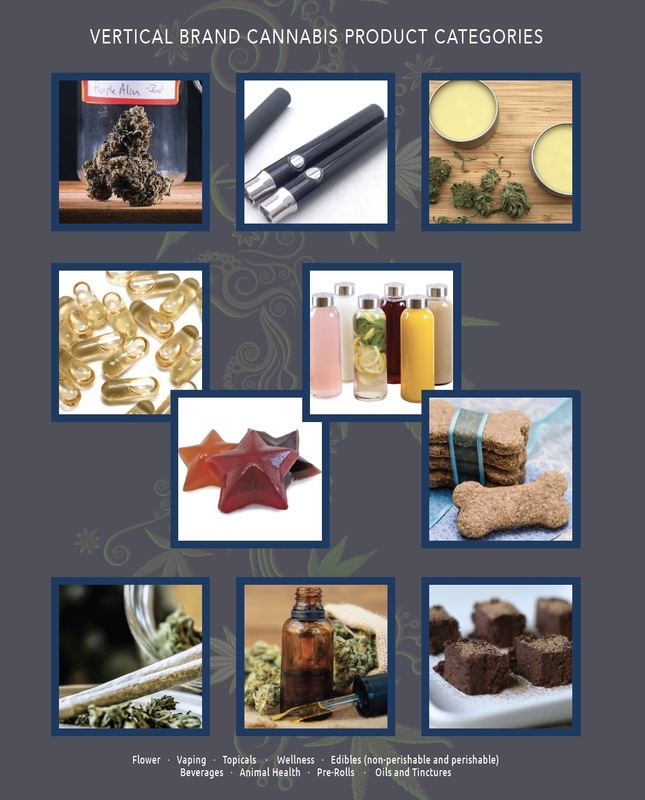 Follett also said CBD, which has a slightly nutty flavor, is a better option for wine and spirits manufacturers that don’t want a distinct cannabis taste or smell in their products. But he noted that it takes time, effort and creativity to mix the oily product into beverages, which can deter some brewers and distillers. Like the cannabis sector, the alcohol industry faces a web of regulations – in this case from both the states and the feds. Consequently, hemp, CBD and extraction companies must be aware of the complicated regulatory process when wading into the alcohol business. The U.S. Drug Enforcement Administration’s declaration in December 2016 that CBD is a Schedule I controlled substance – like marijuana and heroin – complicated matters. Last year, a Colorado craft beer producer, Dad & Dude’s Breweria, butted heads with the feds over the brewery’s production of a non-THC, CBD-infused beer. Dad & Dude’s had previously won approval for the brew from the federal Alcohol and Tobacco Tax and Trade Bureau (TTB). The brewery, which continues to sell the beer on its premises, is for now locked in a legal battle with the DEA as well as the agency. The TTB, meanwhile, presents other hurdles. Any alcohol company that sells across state lines, for example, must secure approval from the agency. Back in 2000, the agency’s predecessor issued requirements covering formulas, processes and labels for domestic hemp products. The policy requires all alcoholic beverages that contain hemp or a hemp component to submit a lab report stating the amount of THC in the hemp, a move that dovetails with the DEA’s policy. “It follows the DEA’s rules, and the intent of those rules are to ensure the product is THC-free or has trace amounts,” said Ryan Malkin of Malkin Law, a Miami Beach, Florida, firm that specializes in alcohol law. In December 2017, Weatherford, Texas-based TVM Wines received TTB approval to manufacture and sell its hemp wine across state lines. 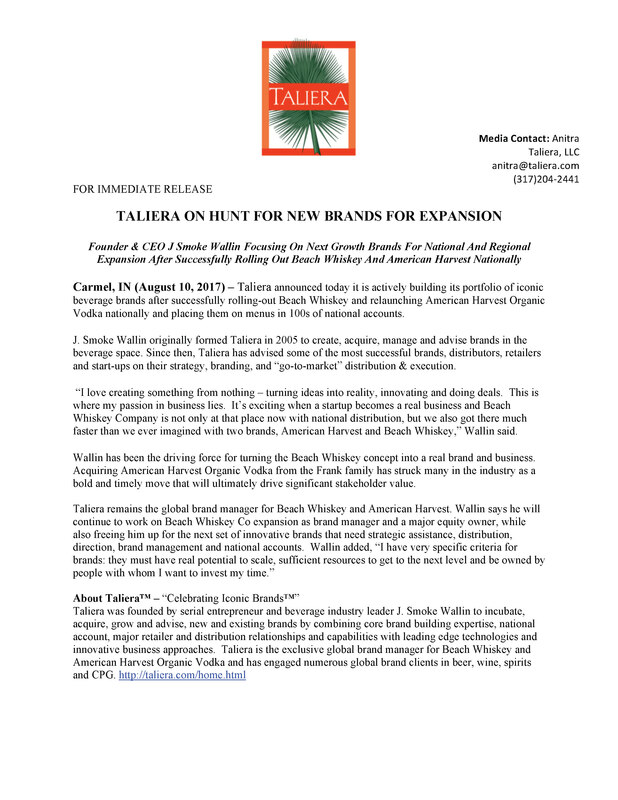 The process took two years and 28 different paperwork submissions to the agency, said Elease Hill, TVM co-owner and vice president of sales and marketing. Hill said the key was to supply the agency with lab tests showing the hempseed oil used in her sweet, citrus-based wines had less than 4 parts per million THC, and that the oil was derived from hemp stalks, roots or stems rather than flowers or resin, which is considered a Schedule I substance by the DEA. Hill found her suppliers through a list provided by the Texas Hemp Industries Association and by simply Googling hempseed oil companies. She read product reviews and then called the companies to check their references and lab work documentation. Hill eventually partnered with Keystone Canna Products. Its hemp oil and food brand, Cannagenix, specializes in paper trails and lab testing, according to Follett, the owner. “There are a lot of hemp and CBD products but not a lot of quality documentation,” he said, noting that growers and CBD companies that can’t produce a regulatory paper trail are likely to be shut out of the alcohol business. But, like most cannabis law, this is a gray area. The determining factor appears to be where the beer, wine or spirits are sold. Even if alcohol doesn’t cross state lines, regulations vary from state to state, just as they do with cannabis. 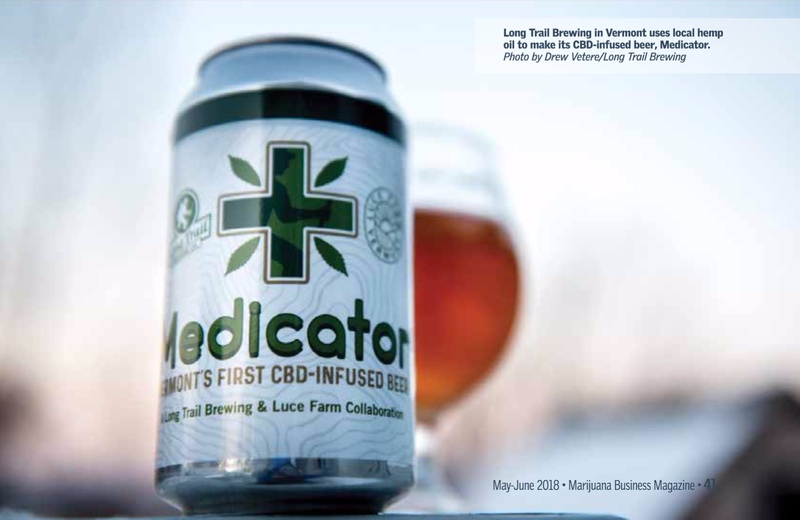 So far, Long Trail’s Medicator beer hasn’t run up against the TTB, even though the can says: “Vermont’s first CBD infused beer.” But the company has made only three small batches and has limited sales to the brewery’s pub. 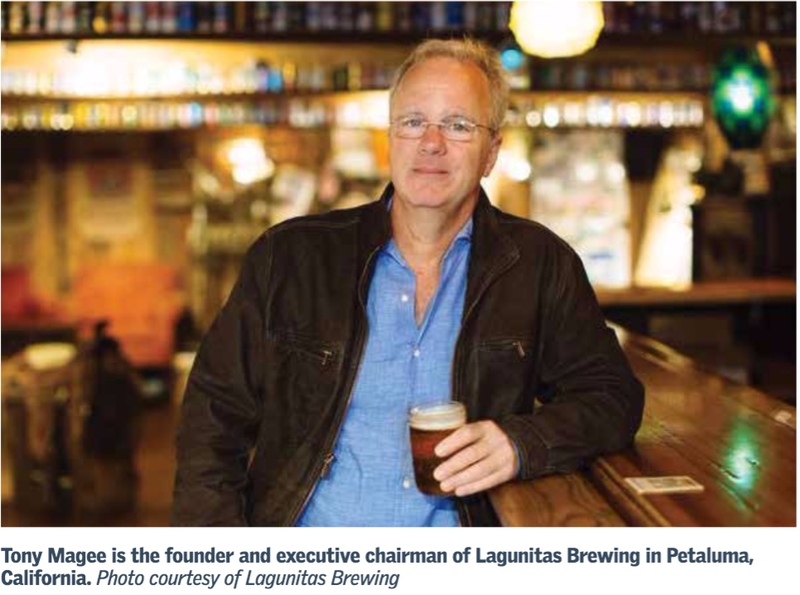 In California, Petaluma-based Lagunitas Brewing uses cannabis terpenes in its SuperCritical Ale. CannaCraft, a vertically integrated medical cannabis producer and distributor in Santa Rosa, California, extracted terpenes for the beer using a carbon dioxide process. I never imagined I’d be writing about this topic. 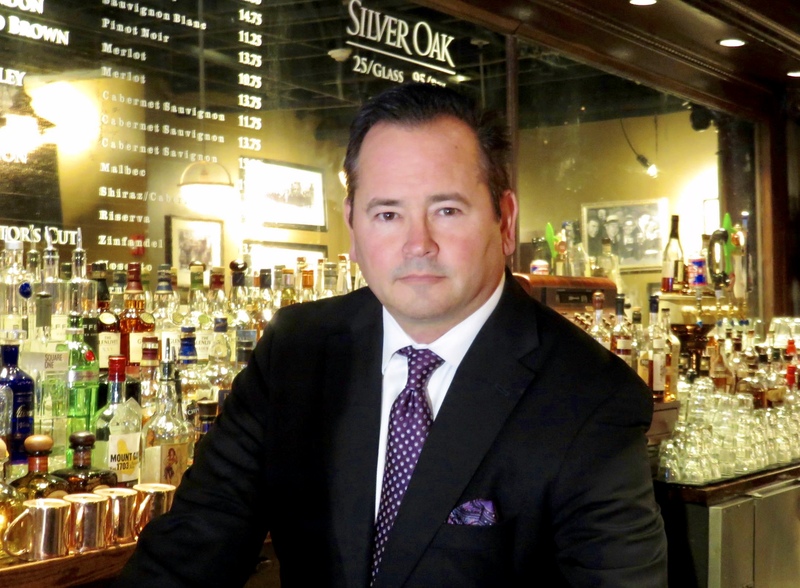 For 25 years, I’ve enjoyed an amazing journey as a serial entrepreneur building companies and brands, leading companies in the beer, wine and spirits, distribution, and technology industries. The alcohol industry has been good to me and to my family. This conversation opened my eyes to the many benefits of cannabis. There are more than 50 medical conditions for which cannabis is legally recognized as some form of therapy or medicine including Alzheimer’s, anorexia, arthritis, cancer, chronic pain, epilepsy, and post-traumatic stress disorder. I’ve come across people suffering with chronic pain and others going through cancer treatment. Cannabis allows them to live their lives without the destructive side effects of opioid based pain medicines. The more I learned about the benefits of cannabis to people suffering, the more research I did to understand the industry. Based on this, I’ve come to believe that its place in society needs to change. 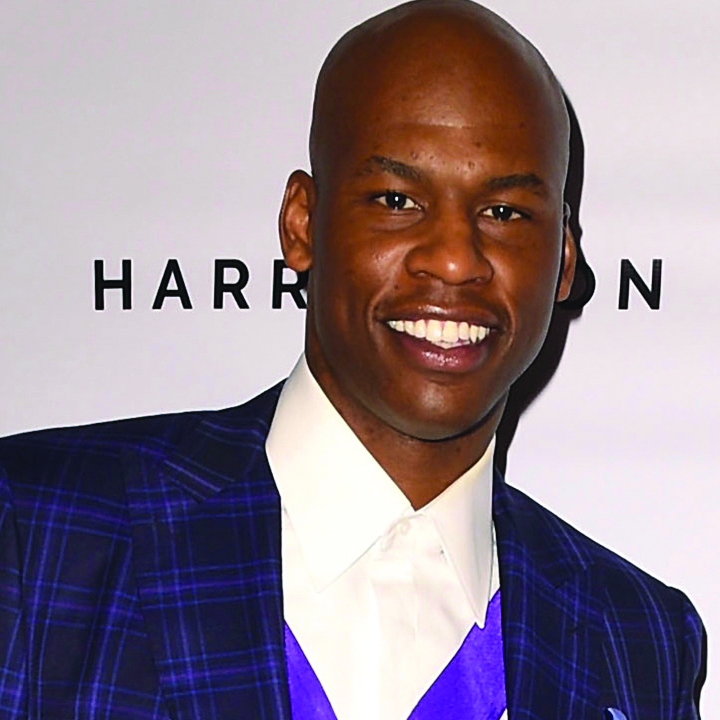 Al Harrington is a 16-year NBA great and cannabis entrepreneur. I used to watch Al at Pacer’s games. Al found his way into medicinal cannabis and CBD to treat his pain from a botched knee surgery. He tells a funny story about recommending medical marijuana to his grandmother Viola. She suffered from multiple ailments, and after some initial resistance, she tried it and immediately felt better. His cannabis brand, Viola, was soon born. He also has his Harrington Wellness line of CBD. Al’s story is genuine. In an interview with Al, former NBA commissioner David Stern pronounced that the laws and rules need to change around cannabis (See Al Harrington and David Stern). Al, and my friend, musician, and NFL great Kyle Turley, have been outspoken advocates for awareness and change. It’s clear, cannabis prohibition and the aggressive pursuit of its enforcement have also particularly ravaged the African American community. The opioid epidemic is destroying lives, families, and devastating whole communities. I personally have more than one friend who has lost a (grown) child recently, due to accidental overdose or tainted product. We must do something to stop this epidemic. Doctors overprescribing opioids is one of the primary causes. Many patients start out with legal prescriptions and become addicted. They then turn to the illegal market to meet their addiction needs. Cannabis can be used to help wean people off these destructive drugs. Ideally, it could be prescribed to avoid opioid abuse in the first place. It is a legitimate part of the solution. Given this, I decided to find out how I could make a difference. I attended the MJ Business conference in Las Vegas and networked with Young Presidents Organization (YPO) and other friends. I wanted to figure out how I could play a positive role in this emerging industry. I did some research to understand what led to the abrupt prohibition of cannabis in the US in 1937. I learned that Indianapolis pharmaceutical powerhouse, Eli Lilly was in the cannabis business until the prohibition. Cannabis prohibition seems to have been motivated by a combination of racism and the business interests of a few that had political influence (Why Is Marijuana Illegal). I learned that many feel the ratcheting up of cannabis to a Schedule I drug (the same as Heroin) in 1970 also had racist motivations. It was certainly not based on science. The American public now overwhelmingly supports cannabis legalization, with over 64% in favor according to Gallop. It is more popular than any current politician. State by state, citizens have made local option the law of the land. There are now 30 states plus Washington DC where medical cannabis use is legal. There are 9 states where adult recreational use is now legal. This is a prime example of the importance of state’s rights leading the way. As the industry has come out of the shadows of illegal activity and into the light of permitted activities in many states, incredible entrepreneurial spirits have been unleashed. I feel the excitement of being at the forefront of another Repeal of Prohibition. This time though, we have the added dimension of extraordinary medical benefits. Drawing from my 25+ years in the beverage alcohol business, I see many parallels to the industry I know well. The legal framework around local option, licensing and taxes are similar to alcohol beverage laws in many respects. Constellation Brands [STZ] recent $191 million investment into Canopy Growth [WEED] further convinced me that this developing industry is going mainstream. 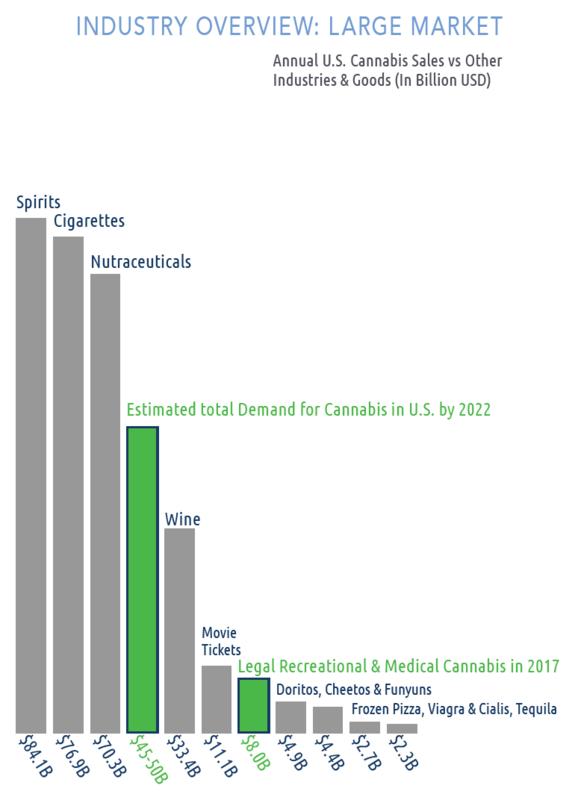 Legal cannabis is likely to rival the Beer, Wine and Spirits categories and exceed $50 billion annually in the coming years. Some analysts predict the US industry over $100 billion. Regardless of the number, it is and will be massive. I met my partners Todd Kaplan and Courtney Dorne through YPO last year. I joined the team at Vertical Companies as a partner, President of Distribution and Chief Marketing Officer in January 2018. I could not be more excited in this venture, building a large scale new enterprise in the emerging cannabis space. One of my objectives will be to play my part in bringing the right coalitions together to address and correct the State vs Federal conflict that exists today. I spent a fascinating week learning about two of the hottest investment and business opportunity spaces right now. The block chain, crypto and initial coin offerings (ICOs), and the cannabis industry are literally on fire. Given this, I wanted to get an understanding of what’s really happening. I’ve been following the development of the block chain/coin movement along with the emergence of the legal cannabis business as these both are displaying signs of developments that may cause massive disruption (and therefore potentially big opportunities). Venture capitalist Tim Draper has been an outspoken proponent of the block chain and crypto offerings (see Exclusive: Billionaire investor Draper to participate in blockchain token sale for first time), while Jamie Dimon of JP Morgan Chase has been dismissive (see CNBC). Constellation Brands (STZ-B) announced recently that it had agreed to take a 9.9% minority stake in the $2 billion Canadian medical marijuana company Canopy Growth. The stake is worth about $191 million, though Constellation will have the option of purchasing additional stakes in the future. This aggressive move marks a significant milestone with the first publicly traded US company making a material investment in the cannabis space. For the industry in which I have spent much of my business career — beverage alcohol (beer, spirits and wine), it’s also a taboo shattering wake up call. The financial community apparently agrees with the financial analysts, giving high marks for Constellation’s vision and the market supported it with a gain of over $1 billion in STZ’s market cap (essentially more than paying for the investment). Visiting Colorado frequently, I’ve seen how quickly the legal use of medical and recreational marijuana has ramped up with the state of CO taking in over $550 million in tax revenue as of July 2017. 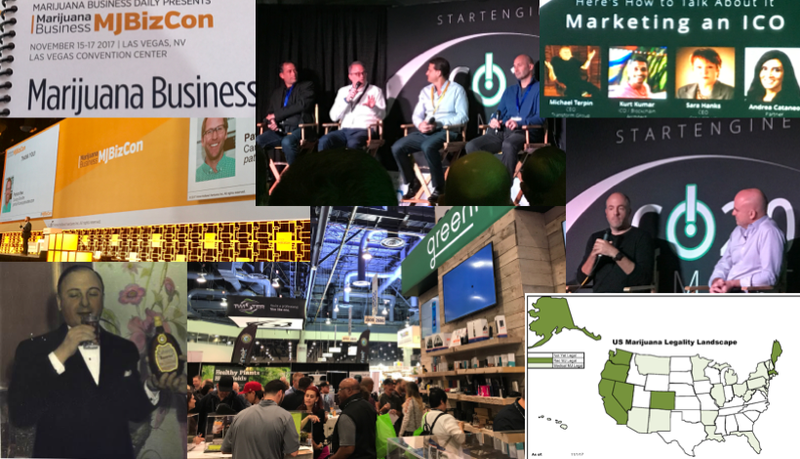 To learn more about each of these rapidly developing industries and to test my hypothesis of potential disruption, I attended the StartEngine ICO 2.0 Summitin Santa Monica followed by the MJBizCon in Las Vegas which together gave me an interesting perspective. Here I will share some of my observations. First, I met a number of really smart people pursuing these industries with a wide range of business and investment strategies. I had the good fortune to join up at YPO meeting-in-meetings at both events and, as usual, learned a great deal from these informal gatherings and met some of the people leading the way in both industries. I cannot say enough good things about the YPO network and the ability to quickly get to the movers and shakers in any industry or geography, globally. The hype around these industries surpasses the craft alcohol craze and matches Dot.com in 1997–2000. I know both of these booms well having participated by investing and starting my own DOT.Com eSkye.com raising over $55 million (Tim Draper’s Dad, Bill Draper, invested see Forbes) and my multiple ventures in the craft beverage space. The bright light inevitably attracts all kinds of people and as in both of these examples, there are a ton of people who have limited or no business skills coupled with business ideas/plans/ventures with little to no chance of scaling to success. The cannabis side has more similarities to craft beverages in that it appears that 95% of businesses currently in or entering the space are really “mom and pop” operations that are more lifestyle businesses than scalable enterprises. However, what is absolutely clear to me is that, this is changing rapidly with the addition of serious investors and business operators. Block Chain — ICO What is it? The technology of the block chain is real and big. I’m convinced over time, it will fundamentally change the financial side of all industries. This MIT Sloan article does a pretty good job of discussing the potential. Its potential is hard to overestimate but not without controversy. See John Battelle’s discussion of it here Alien, Dismissible, Dangerous, Greedy, True and the fights going on inside Venture Capital firms here CRYPTOCURRENCY MANIA FUELS HYPE AND FEAR AT VENTURE FIRMS . For my non-technical friends, I’ll try to define it here in my own way. For my expert friends, let me know what I get wrong as I’m still learning. The best simple explanation I’ve found so far is A Blockchain Explanation Your Parents Could Understand. Essentially, instead of a central party (think a bank) keeping track of everyone’s money and transactions with each other, the record keeping takes place in public (without revealing names) with 1,000s or more independent operators verifying the information and agreeing on its accuracy before securing it. While banking and financial transactions are the first use, there are many other uses being worked on and many more to come. The ICO “Initial Coin Offering” market is booming with new business ideas for the application of this technology. Over $2.8 billion has been raised using ICOs thus far in 2017. These have been unregulated and range from real businesses to potential frauds. The ICO 2.0 Summit put on by StartEngine was really about bringing the ICO market into the regulated security market in the US. It is clear to me, from the many presentations, that an offering for a coin to fund a venture is an offer for a security, and therefore falls under the SEC. There are many in the crypto world who dislike this and will fight it, but governments are not going to simply sit back and allow investments outside their mandated oversight just because they are called “coins”. Given that, I agree with StartEngine’s CEO Howard Marks that the crowd funding Regulation A and also traditional Regulation D exemptions are the proper way to issue an ICO in the US. Lou Kerner gave an excellent presentation based on his article, Is Crypto (Like) A Religion? & 6 Other Crypto Thoughts . He followed this with a very interesting fireside chat with Michael Jones CEO of Science who is serious about the space and currently has an ICO in the works. We heard from 17 companies planning to do ICOs of some kind. Again, I can’t help but compare this to DOT.Com days as there were clearly real business ideas and teams and others that are simply slapping the ICO label on something that is really not well thought out. What was true back in 1997–2000 in DOT.Com is true today — there are and will be billions of dollars invested in the block chain space, some of it will go into real business ventures and some of it will go into not-so-serious business ventures. Sorting these out will not guarantee your investment is the next Google or Amazon, but is absolutely the key to avoiding almost certain failure. Cannabis — Marijuana Industry — Where is it now and where is it going? From a story in Fortune Magazine regarding Constellation’s investment — “The wines and spirits conglomerate has no intention of selling cannabis products in the U.S. until it is legal nationwide. But the company is betting that legalization is just a matter of time, according to the Journal . However, Constellation may soon sell the marijuana drink product in Canada, where legalization of edible and drinkable cannabis products is expected by 2019. Given the above, what is the current state of the legal cannabis industry and where is it going? · 2014 OR, AK add recreational. Canada liberalization takes root. Over ½ the US population lives in states with legal marijuana use — with 30 states + Washington DC allowing legal medical use and 8 states plus Washington DC allowing recreational use. That being said, it is still 100% illegal at the US federal level. This means there are significant risks and hurdles for investors and businesses who enter the space. Banking is very difficult as the national banks cannot conduct business in the space. Anyone contemplating investing in the space needs to be aware of these issues. In spite of these challenges and an uncertain regulatory environment, many investors and business owners are jumping in with both feet. Public Stocks — these are the Canadian companies like the one Constellation invested in. 4. Ancillary Products & Services — these are all the things around the business from software to equipment to banking to marketing. Canopy is focused on #4 exclusively but there are certainly opportunities in all of these. From a branding and stage of industry development perspective this is literally a “green field”. I saw some interesting but nascent offerings given the time businesses have had to think about and try to develop brands. With new entrants, this will of course change, but right now I can’t help but think it is like the days when Sam Bronfman and Lewis Rosenteil were at the cusp of the repeal of Prohibition ready to launch Seagram’s and Shenley’s whiskies into the US respectively. Where is this headed? It’s hard not to believe there will be continued legalization on a state by state basis. 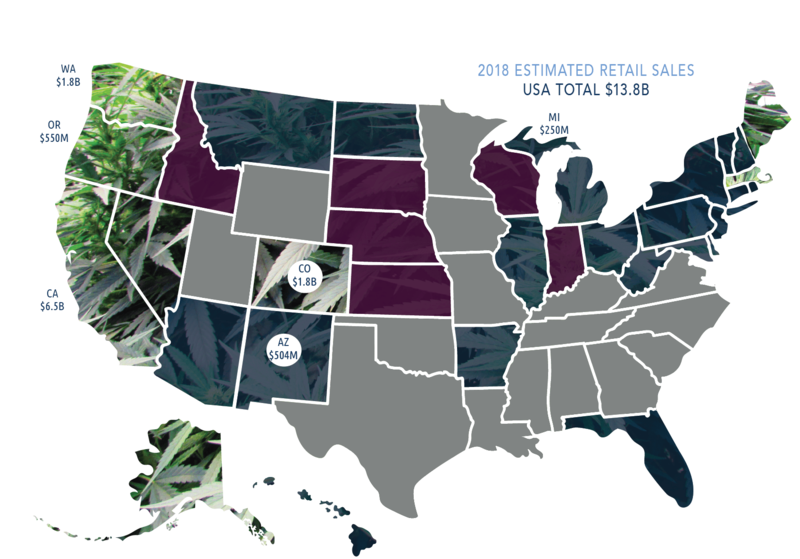 With the overwhelming majority of American’s viewing legal cannabis favorably, and importantly with the amount of tax revenue legal markets are bringing, other states will certainly follow to not get left out. Federally it will likely take longer, but like alcohol and the repeal of Prohibition, it will probably only happen if it is left up to the states to decide how their citizens want to allow cannabis regulation. What’s clear to me is that there are huge opportunities in both these new industries. What is unclear is who will emerge as the big winners. I know from personal experience what being ahead of the market is like. The next few years will be like settling the wild west and a lot of entrepreneurial ventures will be created to try out different ideas in both cannabis and blockchain. I will come back to these topics as I learn more on both and please share any thoughts you may have. Cheers!